First Prize Shaunda, under jockey Ricky Ramirez, races to the third fastest qualifying time. WYANE, OK�OCTOBER 22, 2012�Pyc Paint Your Wagon dominated two-days of trials this past weekend for the $1 million-est. 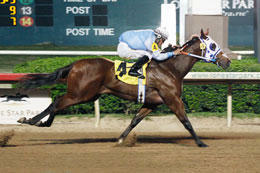 Texas Classic Futurity and and $400,000-est. Texas Classic Derby at Lone Star Park. 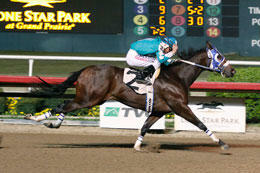 The leading sire of 2012 money earners sired three finalists to the futurity and two for the derby. 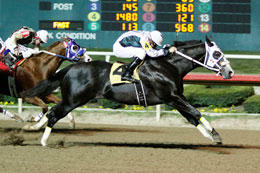 The 10 fastest qualifiers for both races will return on Saturday, November 10, closing night of Lone Star Park's 2011 Fall Meeting of Champions for Quarter Horses, and vie for the winner's purse. Trainer Trey Wood saddled First Prize Shaunda to win the fourth trial by 1 � lengths while setting the third fastest time of :19.541 seconds. The Pyc Paint Your Wagon filly came into the race off an impressive maiden victory at Lone Star Park on September 29, when ran 330 yards in :16.440 seconds, a 106 speed index. The brown filly was the first of the three finalists bred by Weetona Stanley owner of the Lady Bug Stallion Station, with her sons Stan, Steve and Fred Stanley. First Prize Shaunda, also owned by Mrs. Stanley, is out of the Grade 1 winning Mr Jess Perry mare First Prize Leesa. Mrs. Stanley bred 7th fastest qualifier One Fast Wagon, a Pyc Paint Your Wagon filly out Fast Mans Prize, by Heza Fast Man. A winner of four of nine starts this season, the Joe Flores owned miss has earned more than $110,000. She was also second in the RG1 $400,000 TQHA Sale Futurity and a finalist in the $222,000 G3 Harrah's Entertainment Futurity at Louisiana Downs. Jorge Barrera is the trainer with David Alvarez riding. Judd Kearl saddled Heritage Place Futurity(G1) fastest qualifier Pyc Kant Katch Me who qualified 8th fastest in the seventh trial. The Pyc Paint Your Wagon colt has won five of five career start and earned $82,793 this season. Mrs. Stanley bred the 2-year-old from the Disco Jerry (TB) mare Wanna Be Me. For the complete list of top 10 qualifiers for the Grade 1Texas Classic Futurity, including times, sires, dams, owners, breeders, trainers and jockeys CLICK HERE. Tommy Hays and Bobby Barnett's Runaway Wagon posted third fastest time of :21.396 for the Texas Classic Derby after finishing a nose behind all-time leading money earners Ochoa. David Alvarez rides the Firecracker Derby winner and earner of $80,963 for trainer Bobby Martinez. Michelle Meiwes bred Runaway Wagon in Kansas from the Dashin Bye mare, Dashin Vike. Carl Pevehouse's homebred Haulin Candy Salt qualified eighth with a time of :21.496. Clinton Crawford trains the ay filly out of the Salt Lake (TB) mare Salt Lake Spitty. She has earned more than $153,000 with wins that include the Speedhorse Golda and Silver Cup Derby(RG3). For the complete list of finalists, times, sires, dams, owners, breeders, trainers and jockeys to the Texas Classic Derby(G1) CLICK HERE.